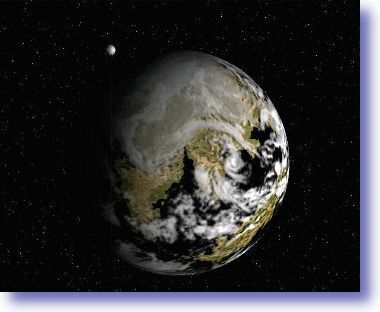 Right: Dyra (the planet of which Jhendor is a continent) as seen from space. Rendered by Mert Vuraldi. The planet of which Jhendor is a part is the third body in orbit around a small yellow sun. Its orbital period is 412 days, each of which is 24.4 of Earth's hours long. 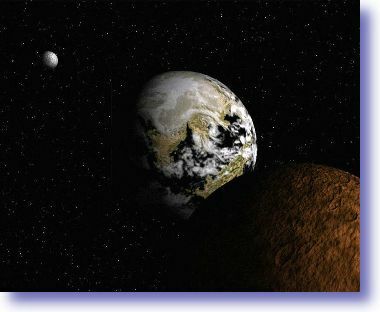 The solar system consists of 7 planets - of which five are visible to the naked eye from Jhendor - and one asteroid belt. The planet has two natural satellites, both smaller than Earth's Moon. They orbit the world in a period of 17 days and 11 standard hours respectively. Jhendor is a large continent that straddles the northern hemisphere of a small planet. Its central land mass is largely covered by the polar ice cap or permafrost. Several mountain chains form a rough circle around this central area and separate it from four subcontinents and several peninsulas that reach out towards the equator. While the regions around the pole are of course subarctic, the lands beyond the mountain ranges have mostly temperate climates. The temperatures reach subtropic ranges only in the southernmost areas of the subcontinents. There are other continents on the planet, but only one of them has been visited by a few merchant ships. Even that one is unknown to most of Jhendor's population. The Restless Ocean separates Jhendor from this land mass, known as 'Terakandor' to the sailors and merchants who have reached its shores. Left: Dyra and the moons Erean (red) and Shenan (silver) seen from space. Rendered by Mert Vuraldi. Roughly each subcontinent is home to one of the four large empires that dominate the continent politically. The insectoid Tlaroian Empire controls the largest area and has the strongest armies. The reptilian Zs'kar and the humans of Narsaria vie for the distinction of being the greatest sailors of the world. Zs'rarn, the land of the Zs'kar, is a republican nation with an aggressive colonization policy, while Narsaria is a federation of city-states that owns the largest trading fleet of the world. The last and smallest realm of the four is another human nation: Jian Tei. It is relatively isolated from the rest of Jhendor and only a few Narsarian merchants have contact with it on a regular basis. On Jhendor directions are usually given in relation to the turning motion of the world (which is an accepted fact). 'Turnward' is the direction in which the world is spinning (East), 'Trailing' the opposite (West). 'Midward' is in direction of the center of the continent (North), while 'Rimward' points towards the sun at noon (South). Our world is an island of order swimming in a sea of primal chaos. It is supported by the god Rekor and the goddess Dyra who court and dance around each other and thereby give the world its spinning motion. While most of the gods are content to watch over the world invisibly, a few can be seen by mortal eyes: Amachtera, the sun goddess, shows us her face each day, while Shenan, the silver moon, and Erean, the red moon, prefer to watch the world by night, although not always. The stars are the brightest souls of mankind who shine down on us from the heavenly kingdoms of the gods. Jhendor is surrounded by the four oceans: The Sea of Storms, the Eternal Ocean, the Sea of Gods and the Restless Ocean. In the middle of the world lies the so-called Realm of the Ice King. Folk belief holds that in its center stands the crystal fortress of a deathless sorcerer: the Ice King. But the wise tell us that the eternal cold of that land is caused by the body of Koris, the dead winter god, that is buried at its center. The farther one journeys from his grave the warmer it gets. Rimward of the ice-covered land lie the great plains which are in turn bounded by the great mountain chains. Beyond the mountains we find the richest lands, the heartlands of the great realms. The one we live in is the Chelekantar Tlaroi. The Chélek , Empress of the inhuman Tlaroi and avatar of the sun goddess, rules this land. Many human lands are subject to Tlaroian rule since they were conquered many decades or even centuries ago. The second realm - Narsaria - is in contrast a land of free people. They are merchants, not warriors, but their tradings ships reach every corner of the world. The third realm is Zs'rarn. The reptilian Zs'kar, children of the sea god Ulan, have similar skills with ships and sailing to the Narsarians, but they are rarely seen in our lands. I have never seen a man or woman from the distant empire of Jian Tei - the fourth of the realms - but travellers have told me that their skin has the colour of gold and that they are the most beautiful people in the world. If a ship would sail ever farther Rimward, it would eventually reach the walls of the world that keep the primal chaos from mixing with the waters of the world. There the god Ulgor, the dark brother of Ulan, rules over the deepest reaches of the sea. The following maps have been created with Campaign Cartographer and Campaign Cartographer 2 by Profantasy Software Ltd. If you want to know more about this great software, visit their website at www.profantasy.com.